Gather your friends, families and coworkers. Start a tradition and host a Packing Party — it’s a party with a purpose. For anyone who loves getting together with family and friends, and is passionate about giving back to the community, hosting a Packing Party is a perfect way to have fun while making a difference. A Packing Party is a casual fundraiser that supports the Homeless Period Project. Packing Parties can be as simple as an after work get-together or as elaborate as a fully-catered dinner party. 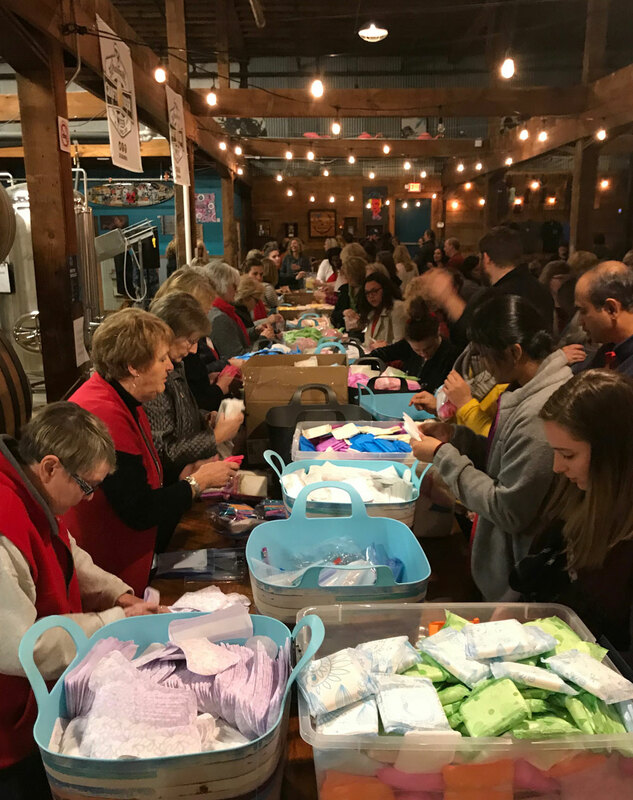 Regardless of your party style, the goal is to provide a fun and enjoyable event that educates guests about the impact of their generosity while building Period Packs and raising funds. Consider this, by simply asking guests to donate what they would normally spend on a hostess gift, it is easy to raise $300 to more than $3,000 at one event. This is enough to provide care for up to 500 individuals in need. Plus, it is tax deductible to the fullest extinct of the law. How to get your Packing Party started. It’s important to organize an event that is engaging and memorable while fitting comfortably into your lifestyle. We are happy to collaborate with you on developing a concept and are happy to share some of our successful experiences. A Packing Party can be as simple as assembling a group of co-workers for coffee and donuts, gathering friends for beers at a local brewery or motivating your congregation to unite and compose Period Packs one day a month. First, choose a location that suits your party’s theme. You may want to consider coordinating with your favorite brewery, coffee shop or bowling alley to host your event in a dynamic public venue. Send your invitations in advance so that your guests have time to plan to attend. We recommend emailing or posting them at least three weeks before your Packing Party and providing a reminder three days before the event. We provide several templates as part of the Homeless Period Project Party Kit to ease your workload, but please feel free to use your own if you prefer. If appropriate, additionally create your event on Facebook or Twitter and link to the Homeless Period Project and our Facebook page to provide more information as well as to support direct donations. Submit the supply list to guests. You will receive this as part of your Homeless Period Project Party Kit. Simply supply it to your guests. We are in need of tampons, pads, liners, hygiene wipes and quart size Ziploc bags. The day of the event, remember to have fun. Once your guests arrive, make sure everyone has time to mingle, catch-up and eat or drink. This time gives you the opportunity to ensure everyone is familiar with the Homeless Period Project mission and your passion for helping. After your guests are comfortable and everyone is in the spirit of the party, prepare to create Period Packs and collect donations to help women and girls in need. Organize supplies so that they are easy to reach and then gather guests to begin packing. Depending on the size of your event, guests can gather around a table and assemble Period Packs, or you can create assembly lines and pass the kit from station-to-station. For instance, the first person in line will pick-up and open the Ziplock bag; the second guest will insert a pad, the third guest will add a hygiene wipe, and so on until the Period Pack is assembled. The last person in line will place the fully-assembled Period Packs into an unscented kitchen size garbage bag and prepare the container for transport or pick-up. Supplies are much needed as well as financial support. Please use the Donation Sheet supplied in your Homeless Period Project Party Kit to accept donations by check or money order. We gratefully accept online contributions through the Homeless Period Project donation form. Remind your guests that in lieu of a hostess gift to please consider providing a much needed financial contribution instead. Any amount is appreciated. For less than $10 a month, we can supply a package of hygiene products to an individual in need and continue to advocate on behalf of all to legislators, community leaders and corporations. A Homeless Period Project Packing Period Varius, orci mauris viverra ante, eget egestas turpis sapien vel orci. Donec eu ornare augue, ut efficitur velit.